This PDF 1.5 document has been generated by LaTeX with hyperref package / pdfTeX-1.40.18, and has been sent on pdf-archive.com on 03/01/2019 at 16:53, from IP address 193.186.x.x. The current document download page has been viewed 103 times. meaning but which are not lexicographically similar is a key challenge in many computer related fields. to substitute the traditional techniques where necessary (Martinez-Gil, 2014). based on fuzzy logic that is able to outperform these traditional approaches (Martinez-Gil, 2016). usually appear in dictionaries. (Martinez-Gil &amp; Montes, 2013). Martinez-Gil, J. (2014). 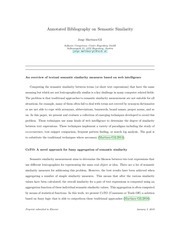 An overview of textual semantic similarity measures based on web intelligence. Martinez-Gil, J., &amp; Aldana-Montes, J. F. (2013). 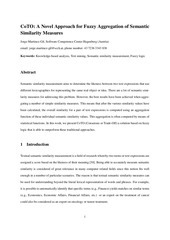 Semantic similarity measurement using historical google search patterns. Information Systems Frontiers, 15 , 399–410. URL: https://hal. This file has been shared by a user of PDF Archive. Document ID: 01904490.